The 2016 January issue of the Computational Crystallography Newsletter (CCN) contains a short communication titled "Characterization of base pair geometry" (p.5-8) by Dr. Wilma Olson and me. This essay had been mostly motivated by two publications in the 2015 July issue of CCN by Dr. Jane Richardson: an article titled "A context-sensitive guide to RNA & DNA base pair & base-stack geometry," and an 'Expert advice' of 'Fitting Tip #10' titled "How do your base pairs touch and twist?" 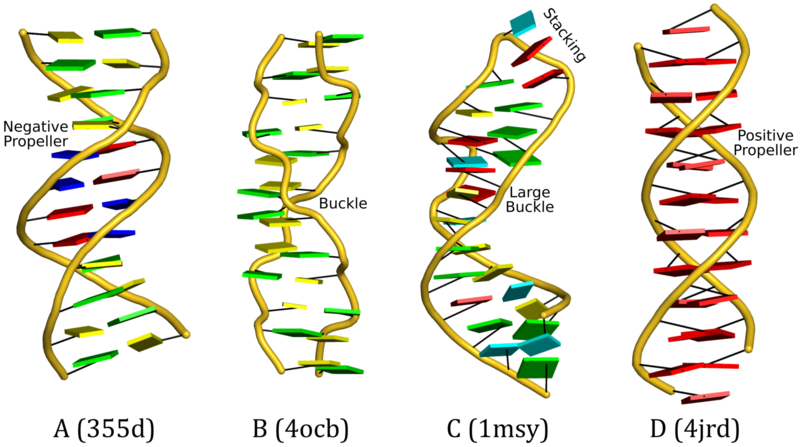 In both pieces, Richardson emphasized the importance of base-pair (bp) non-planarity introduced by Buckle and Propeller (see Figure below) for improved fit of DNA/RNA models to X-ray electron density maps. I derived a complete set of six simple bp parameters for a complete qualitative description of bp geometry. The term 'simple' is used because the parameters are more intuitive for non-canonical pairs, and to differentiate them from the existing local bp parameters in 3DNA. In the CCN short communication, we also highlighted the DSSR-introduced cartoon-block representations of DNA and RNA structures that combine PyMOL cartoon schematics with color-coded rectangular base blocks (See Figure below). The simple, informative cartoon-block representations facilitate understanding of the base interactions in small to mid-sized nucleic acid structures where the base identity, pairing geometry, and stacking interactions are immediately obvious. 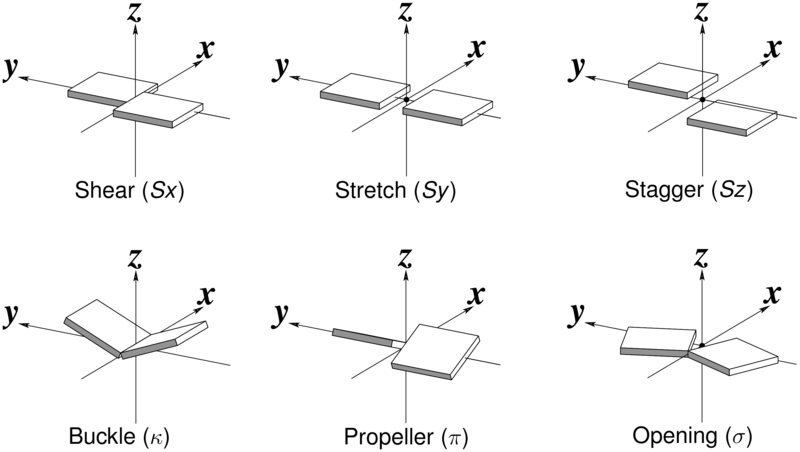 A blogpost with the same title "Characterization of base-pair geometry" contains details for reproducing the cartoon-block images in the figure above. See also links therein for further information.